Democrats expected that the Republican-controlled legislature and Republican governor would continue to be emboldened to pursue an extreme agenda in the current session. Much of the new legislation introduced so far by Republican legislators confirms the Democrats worst fears. 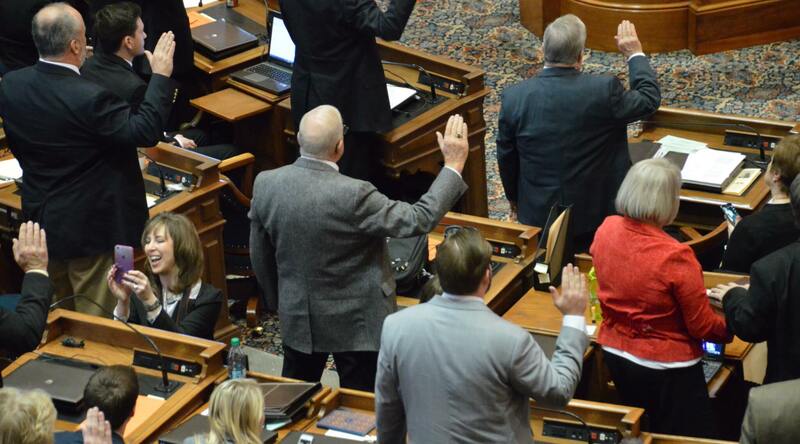 Ranging from abolishing the Iowa Department of Education (Sen. Zaun), ending university tenure, relaxing gun control measures to more assaults on reproductive health; it is a far-right wish list. Their agenda is based on an ideologically-driven scheme to literally take Iowa backwards. It is a rejection of common sense and fact-based solutions replaced by far-right dogma. The Republican bill to reinstate the death penalty is a prime example of going backwards. Democratic Governor Harold Hughes signed the bill that ended the death penalty in 1965. Now Iowa Republicans want to reverse 54 years of Iowa history that demonstrated the death penalty was unnecessary for a fair and effective criminal justice system. Nationally, many Democrats and Republicans are stepping forward to reject harsh sentences, eliminate mandatory minimums and advocate for prison reform. They realize retribution, severe punishment, long confinement and inequality in sentencing is counterproductive to justice and rehabilitation. Yet Iowa Republicans are stubbornly clinging to false claims of a need to reinstate the death penalty. A group of two dozen progressive organizations led by Connie Ryan, Executive Director of the Interfaith Alliance of Iowa, conducted their first Moral Monday meeting this past week at the Capitol. They invite legislators and interested citizens and organizations to meet each Monday during the session to discuss proposed legislation. The topic this first week focused on the capital punishment bill. Democratic Representative Marti Anderson of Des Moines and Tom Chapman, Executive Director of Iowa Catholic Conference, were the featured speakers last week. They discussed the significant factual evidence that indicates reinstating the death penalty would be a monumental mistake. The cost to taxpayers of execution is far greater than the cost of life in prison. The deterrent effect of capital punishment is unproven. The fact that innocent individuals have been wrongly convicted and executed suggests the state becomes complicit in unacceptable deaths. Tom Chapman, executive director of the Iowa Catholic Conference, said they oppose the death penalty bill based on a moral perspective. House File 62 is the latest attempt to reinstate the death penalty in Iowa. It was introduced by Rep. Skyler Wheeler, R-Orange City. It is expected that a companion bill will be introduced in the senate. “It’s one of the things I ran on in ’96, and I still think it’s an appropriate punishment for capital murder,” said Sen. Jerry Behn, R-Boone. First elected in 1997, it will be the 22nd consecutive year he has introduced a similar death penalty bill. “Life without parole sets the bar pretty high and may be a harsher punishment,” he said. As the minority party in the legislature, Democrats have little power to stop the Republicans’ extreme agenda. However, it is essential that groups such as the Moral Mondays’ organization expose these backward proposals and speak out in defense of the truth. The Moral Mondays group meets at noon on Mondays at the Capitol. It is hard for me to even imagine that any politician would want to do this. I just makes no sense and is morally reprehensible! This is a distraction from way more important things these nincompoops have done and are wishing to do . Simply state the cost of putting someone to death as opposed to life in prison and leave the argument there because we in reality don’t have the votes to stop these fools anyway . Concentrate on the most important things and making the general public aware of them and telling them everyday voting matters because it can’t be SAID ENOUGH !!!!!! Re: Sen. Behn – This will be the 22nd year it was rejected, too. I’d sure like to know the rationale behind bringing this atavistic tool back. Dems may be in the minority, but there should be enough Republicans to defeat this wrong-headed measure, too. I notice, too that many of these advocates for the death penalty call themselves “pro-lifers”, too. Hypocrisy much? NO to turning backwards! Iowa was right 54 years ago and should continue on No Death Penalty path.